March in our mountains has been more lion than lamb thus far. Yesterday we awoke to some snow and today, although it is a beautiful day, we can hear and feel strong winds heading down from the higher elevations. It takes some snow and the sun at just the right angle to see the bride and groom of Mt. Pisgah. Legend has it that a young couple wished to marry, but the bride's father objected. In their wedding clothes they raced along steep trails on the mountain, followed closely behind by her father. In the snow, they slid off the trail and off the mountain to their deaths. Look closely at the photo to see the groom on the left leading the bride with the train of her gown trailing behind her. A little snow on our road. 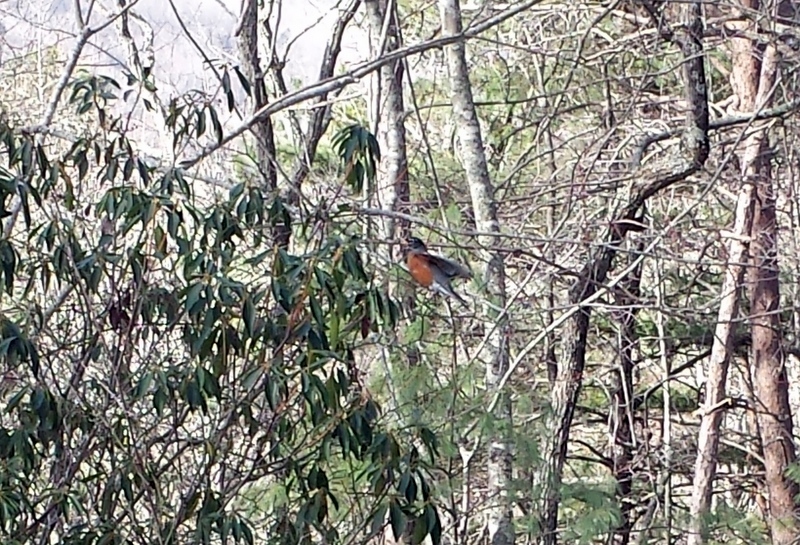 The good news is that robins are appearing everywhere!